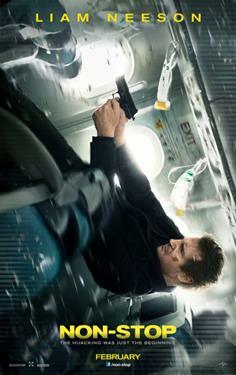 Global action star Liam Neeson stars in Non-Stop, a suspense thriller played out at 40,000 feet in the air. During a transatlantic flight from New York City to London, U.S. Air Marshal Bill Marks (Neeson) receives a series of cryptic text messages demanding that he instruct the airline to transfer $150 million into an off-shore account. Until he secures the money, a passenger on his flight will be killed every 20 minutes.